This script allows you to define “Parameter bonuses” for your actors and enemies. A paramter bonus is simply a bonus that will be added to your parameters based on a formula. The bonus itself could be an increase, or even a decrease in stats if you provide a negative value. For example, suppose you had custom parameters that allowed you to define stats like “strength” or “intelligence”, where str increases your atk and max HP params while int increases magic attack and magic defense stats. You can use parameter bonuses to define formulas that will allow your str and int stats to contribute to the other parameters. 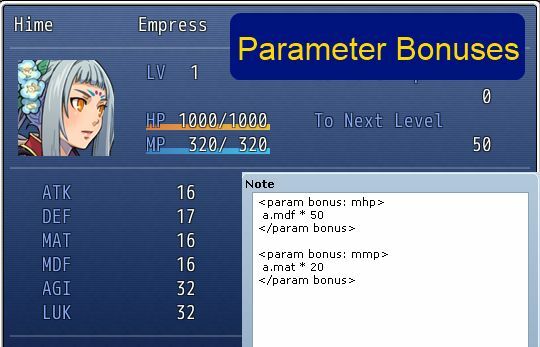 Since the parameter bonus can be any formula, you can define bonuses based on anything. Parameter bonuses can be defined in actors, classes, weapons, armors, states, and enemies. Actors will inherit any bonuses defined in their class, equips, and states. Enemies will inherit any bonuses defined in their states. Because equips and states can be changed, you can use this to create unique effects. And the formula can be any valid ruby formula. multiple bonuses for the same stat; simply add more of the note-tag. likely not a bug in the script. Hi there! Is it possible to call N.A.S.T.Y. Extra Stats to this? I figured it would work because it works just fine with the Custom Damage script! How to add extra stats to the script? Hey Hime, is there a way to do the exact same thing as this script does but with ex params? No, this script does not support ex-params or s-params. However, it could be added. Hi, I’m having a problem with this script. In my game, I like to rename all my attributes (i.e. atk becomes str, def becomes dex…). Your script works great for me normally, but if my attribute name is not the original, it doesn’t seem to work. And yes, I make have tried both tagging the attributes in the formula with their original as well as their new tags, i.e. I have tried both using a.atk and a.str, neither one works if I for example change my Atk attribute to STR. If you could help me with this issue, it would be GREATLY appreciated! I have also tried using param bonus: atk since my “Str” attribute is just the atk value renamed. If I use this same notetag with atk and I don’t rename the atk value, then the script works. the same tag you give in your example…which works great for me when I leave the “atk” parameter as is, but when I rename it to “str” and tag it accordingly, then the script doesn’t produce any effect. The name of the param beside “param bonus:” is reserved. “atk” will always refer to the 2nd parameter in the database. You can rename it to “str” but you still need to use “atK for the note-tag. OHH, got it! Working now, thanks so much. For those that want to apply bonuses to actor &apos;sparam&apos; and &apos;xparam&apos; as well. Create an issue in the issue tracker if you have trouble. Added support for enemy bonus parameters.